The traditional face of camping — the trusty log cabin — is getting a radical makeover and attendees at the L.A. County Fair on Sept. 27 will be able to see a bold design by College of Environmental Design students that has been drawing attention throughout California. Students from this past spring’s Architecture 503 studio will be displaying their important work at a 1: 30 p.m. reception during Cal Poly Pomona Day at the L.A. County Fair. The gathering will be at the Wilderness Ridge stage area across from a prototype of a cabin designed by the students. The students created innovative designs for cabins to be used in California State Parks. Grant funding to support Associate Professor Juintow Lin’s graduate design studio course and the building and transporting of a model was raised by ENV Dean Michael Woo, a member of the Parks Forward Commission, the statewide initiative to chart the future for our state parks. The cabins are expected to be mass produced in the near future and located in state parks. Woo and Lin will give short speeches detailing the students’ work as well as that of Parks Forward and the students will be recognized and honored. Cal Poly Pomona President J. Michael Ortiz will also attend. For those who are worried about the recurrence of the high temperatures of the past several days, free lemonade and water will be available and the short program will take place under a canopy. Current staff, faculty and students will receive free admission to the fair on Sept. 27 with a printed coupon and identification card. Discounted tickets for alumni also will be available. For more information on the discounts and to get the coupons, visit www.csupomona.edu/~oslcc. Make sure to take advantage of the shuttle that will be leaving Cal Poly Pomona’s Parking Lot C every 30 minutes for the fairgrounds’ Gate 1. 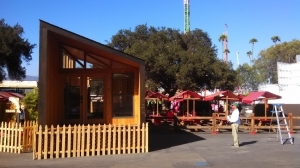 The Wedge cabin, as it has been named, was a big hit at the California State Fair and has received a wealth of media attention in the past couple of months. Now you can see it with your own eyes at the L.A. County Fair. To see recent media coverage on the work by the studio, visit www.revampthecamp.com/in-the-news. For additional information about Cal Poly Pomona Day and a map of the fairgrounds, visit www.csupomona.edu/~oslcc/cpp-day-at-the-fair.shtml.